Australian captain Ricky Ponting on Wednesday said he was unaware why Michael Hussey was not given more time to regain fitness but added that the uncertainty over when he would recover could be the reason for dropping him from the World Cup squad. Ponting said leaving out Hussey due to a hamstring injury was a huge loss for the team in its title defence, but the selectors wanted to have as many fit players for the start of the tournament as possible. Hussey had himself admitted that he would have missed the first two opening matches even if he had made it to the squad. "I actually don't know (why Hussey wasn't given more time). I'm not sure if the selectors have answered that question today or yesterday either, but I know what the selectors had spoken about -- they wanted to have as many fit guys ready to go for the start of the tournament as possible," Ponting said before leaving for India. "I think the medicos weren't entirely sure or convinced when Mike's injury was going to come right. Just the uncertainty around his recovery time was the main reason he wasn't selected. "(Hussey) is a massive loss to our group. He's a class player in this form of the game ... a very experienced player, a leader around our group. I don't think there was anything easy about squeezing Michael out of the squad, I don't think that was an easy decision to make," he said. 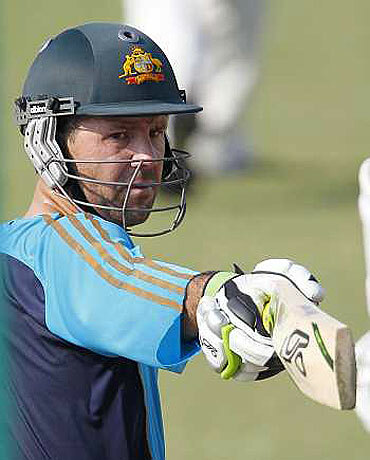 Ponting was given the nod to lead the side despite missing the whole of the ODI series against England after fracturing his finger in the third Ashes Test and he admitted he is still being hampered by the injury, a fact which Hussey could argue that he was treated unfairly. He said he was even preparing to play through pain in his fifth World Cup and the broken finger will not hamper his performance. "If I've got pain (while training), so what? If it can function it's 100 per cent. That's the way I've always looked at those things. Most of the players play with some sort of pain at different times. It does feel a lot better now," he said. "There's not many fast bowlers who can say they've played a game pain-free ... I'll look at different ways of protecting it ... but I'm confident it won't hinder me at all." Ponting said he would probably wear a guard to protect the injured finger and ruled out taking his usual fielding position in the slips during the World Cup. Ponting said he wanted to take part in Australia's two warm-up matches in Bangalore -- against India on February 13 and South Africa two days later. "I've been a long time out of cricket and I need to be playing both of them if I can, to make sure my game's in order," he said. The Tasmanian said being out of the team for long had been a trial but he has been encouraged by the 6-1 defeat of England in the ODI series that followed the Ashes debacle. "We're in good shape at the moment, we've just got to keep improving over the next few weeks and make sure at the big end of the World Cup that we're improving from where we are now," he said. "Looking at the last few results, I think we were very satisfying against a pretty good England team. The most inspiring thing about the last series for me was that when it looked like we were down and out and beaten, we found a way to win games. He said David Hussey would fill his older brother's role in the team. "Listening to him the other day he said he probably didn't make the most of his opportunity last time around, and this time to me he looks a better and more composed and more confident player," Ponting said. "He's been able to win a couple of games with a couple of very solid knocks for us." Australia play their first World Cup match against Zimbabwe in Ahmedabad on February 21.